First time on DVD! Based on the comic strip by Will Gould, the serial followed the adventures of tough guy police detective "Red" Barry (Crabbe) in his quest to recover valuable stolen savings bonds. 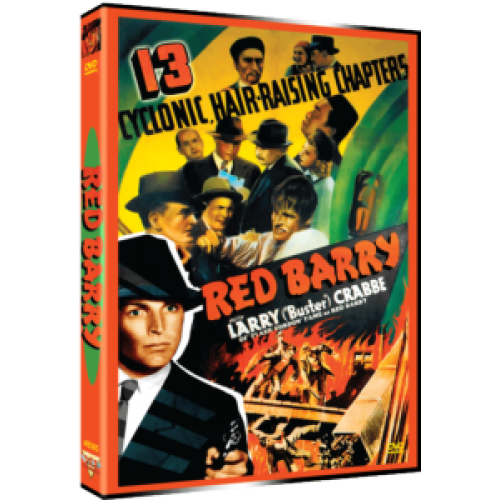 Crabbe has to deal with a gang of Russian crooks (headed by Edna Sedgewick and including Stanley Price), a group of Chinese agents (headed by Cyril Delevanti) and a bunch of American/Chinese racketeers (headed by Frank Lackteen, Wheeler Oakman and a young Tom Steele), as well as a hostile police commissioner (William Gould; no relation to the strip's creator) and a bumbling British sleuth named Valentine Vane (Hugh Huntley). Despite all the conflicting gangs, Crabbe manages to come out on top with the help of female reporter Mississippi (Frances Robinson) and Police Inspector "Scotty" Scott (Wade Boteler). Crabbe was ideal as Barry, an unshakable and unconventional cop who didn’t let protocol or “due process” mess up his investigations, and who was in constant conflict with the windbag police commissioner (William Gould).